After all the wiring is in place, its time to connect our power and ground wires. 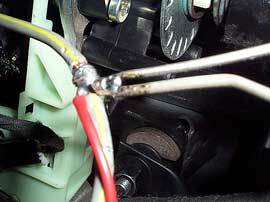 Our installer opened up the tape on the wiring harness that comes from the ignition switch. The ignition switch on Ford trucks is located on top of the steering column, about a foot and a half down from the steering wheel. Our installer used a test light to verify that the gray wire with a yellow tracer was a good power source with the key in the on position. 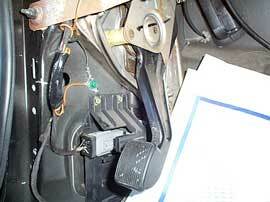 In the above photo, you can see the steering column just above the test light. The insulation on the gray wire is stripped back about a quarter of an inch and the red wire from the power window switch kit is wrapped around it and soldered in place. The wire is taped up with high quality electrical tape. Using a roll of 3M tape which costs about $3.00 a roll is well worth the price. It will last 10 times longer than the dime store stuff. After this is done, the wire loom is then taped up and pushed back into it's original position. Connecting the power wire to this point is a lot harder than connecting it to the fusebox, but it also makes for an electrically sound and permanent connection. In the lower right photo we can see that the brown wire from the loom has been routed down to the kick panel area where it is grounded with a factory ground bolt to the body. 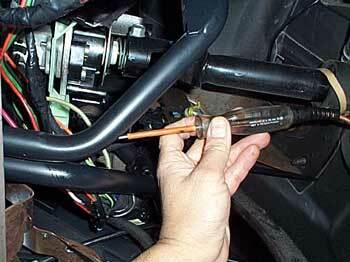 Any other bolt or screw will also work, provided that the paint is cleaned off from the body where the ground ring will contact.